GreenGuard extruded polystyrene (XPS) insulation board product offering is available in additional thicknesses of 3 inches and 4 inches in select 25, 40 and 60 psi compressive strength boards, and a 4-sided routed drainage channel board. The products help to round out Kingspan’s GreenGuard line in commercial markets such as roofing, cold storage, and various below grade and vertical wall applications. The GreenGuard XPS Drainage Channel Board is for use in protected membrane roof assemblies requiring 40 psi or 60 psi minimum compressive strength and drainage channels. Drainage channels are cut along all four sides of the board at .5 inches deep and .25 inches wide. When placed facing down in a protected membrane roof assembly (PMRA), channels permit drainage of water that seeps through to the roof membrane. 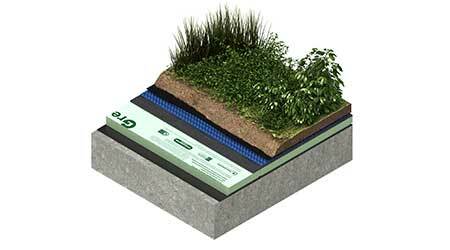 Kingspan GreenGuard XPS Insulation Board offers an R-value of 5.0 per inch of thickness. The product retains its insulating properties over time, has high water resistance and is HCFC free. GreenGuard XPS Insulation Board is available in 2-by-8-foot and 4-by-8-foot boards in selected thicknesses ranging from one-half inch to 4 inches in various compressive strengths such as 25, 40 and 60 psi.